Hello, lovlies! It’s your favorite doll here to give you some amazing back-to-school advice. Whether you’re going into high school, middle school, or you’re still in elementary, read on to learn everything you need to know for tackling the upcoming school year. Why do I sound like a YouTube video?!?! Tip #1: Approach school with a good attitude. Having a bad attitude, or being in a negative mindset, will definitely NOT help you. Imagine the best – all the new friends you’ll make, the new stuff you’ll learn, etc., instead. Tip #2: Smile. Smile at everyone. The nice kids, the mean kids, the good teachers, the cranky teachers. Even smiling when nothing’s funny will dramatically improve your attitude! Try it. You’d be surprised. Tip #3: Challenge yourself. Try a new club, take an advanced/Honors class (if you qualify, of course). Do a team sport, like tennis, XC running, or skiing. Or just challenge yourself to get A’s on your tests or meet a new person every day. Tip #4: Power through your homework. Sometimes, you’ll feel really bogged down with homework – especially if you get something to do from EVERY. SINGLE. TEACHER. When you get home, eat a nourishing snack and take a 15-minute walk before tackling your homework. Every thirty minutes, take a five-minute break and do something productive – switch the laundry, speed-clean the coffee table, or make your bed. Then get right back to work. Tip #5: Breathe. This tip is great when you’re taking a big test. Don’t freak out. Visualize yourself in your happy place, and take a few deep breaths. You’ve got this! I hope my tips help you this year! Are you excited for school? What is your favorite class? When do you start (if you haven’t already)? Psst! Hey, you! Yes, you, person reading this post in your supposedly awful reader that I actually find very helpful but most people do not. In case you did not get the memo, today is Crystal’s fifteenth birthday. Yes, fifteen. Shocking, right? Guys, isn’t Tenney’s Spotlight Outfit so cute on Crystal? If you are considering getting it, you totally should! It’s one of the best outfits I’ve ever gotten. Well, don’t forget to wish Crystal happy birthday in the comments! See y’all on Monday! Hello, darlings! It’s Crystal, here with a few Valentine’s Day scenarios! I hope you enjoy the post, and have a great V-Day! Scenario #1: You have zero idea as to what to get your BFF for Valentine’s Day. What to do about it: What is your friends interested in? Does she adore chocolate? (Just make sure that if she is allergic to nuts, you don’t get her chocolate with nuts in it . . .) What about stuffies? Maybe you don’t even need to get her a typical V-Day prsent at all . . . if she likes photography, get her a memory card! A hand-written note saying why you value her friendship is a nice touch, too. Scenario #2: All of your friends are going out on dates, and you’re the only one stuck at home. What to do about it: DO NOT, I repeat, DO NOT sit around upset about it. They’re out on dates, where they are so focused on looking/being perfect, but you get to sit around in your PJs and paint your nails, watch cheesy romantic comedies, and make popcorn! Which one sounds better to you? Scenario #3: You are SO BAD at art, and all of your Valentine’s Day cards look like they were made by an alien with no thumbs. What to do about it: There are three options here: Explain to your friends that you did your best but you are bad at art before you give them their card, buy your cards at the store, or don’t give them a card at all. If your friends are real friends, they won’t mind a messy-looking card – they’ll value the person who gave it to them instead! Scenario #4: You ate too much candy and now you have a cavity forming . . . Sorry. Can’t really help you with this one. That is all my advice for today! I’m going to wrap this post up with MY definition of Valentine’s Day. A day to celebrate friendship (even if it isn’t of the romantic sort) and have fun! Eat candy. Exchange little presents. While it is okay to celebrate Valentine’s Day with a boy (as long as your parents are okay with it), you can have just as much fun (sometimes more, since you aren’t worrying about being/looking perfect) if you hang out with your BFFs. I’ve gotta run – catch your guys later! On June 1st, 2017, I (AGs in Alaska) published my first post. Since then, amazing things have happened. I have published 80 posts, including this one. I have gotten 2,932 views! And I have done some pretty epic photostories/shoots! In June, I did my first tutorial on how to make an AG stopmotion. I was also nominated for my first award by the AG Homeschooler! In August, I did my first photostory with Lindsey and Morgan. Boy, was that a mess. It was raining and my mom’s iPad was getting all wet. 😦 That was the day of the 2017 Total Solar Eclipse! In September, I celebrated 20 followers! In October, I started doing Day in The Life posts, beginning with Crystal. The girls also celebrated Halloween with a ridiculous spooky prank! In November, we had a epic birthday bash! The girls also celebrated Thanksgiving! Then, December got a little bit crazy. And, on Christmas Day, the AGIA family welcomed Tessa Elizabeth into the family! And now . . . it’s New Year’s Eve???? Seriously, that does not seem possible. Just yesterday I was ringing in 2017. And now? It’s almost 2018, people!!!! You guys are amazing and I could not do this whole blogging thing without your support and encouragement. When I first started blogging just six short months ago, I never imagined that I would make such amazing friends as you guys. 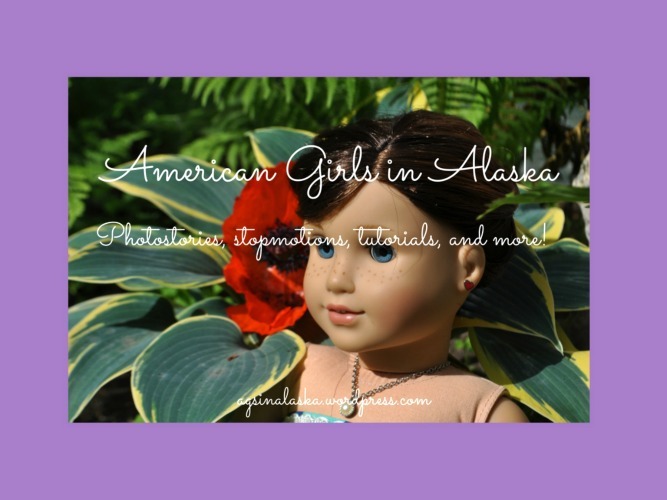 Happy New Year from the American Girls in Alaska family! I hope 2018 is wonderfully blessed for you with all of God’s grace and love!